These situations are not common, but tend to occur more regularly in large, complex organizations with many stakeholders interested in various aspects of analytics and marketing. For example, consider a large publisher that embeds its content on various third-party domains. The publisher wants their GTM code on the page, but the third-party domains may already have their own GTM code, and may be unwilling (for good reasons) to give the publisher access to their GTM. If you find yourself in this unavoidable boat, be sure to read the about the pitfalls below. However, sometimes the question comes up and there is a clear solution that does not involve multiple containers. For example, your agency or vendor may ask you to put their GTM container on your site. Perhaps the agency wants to be able to quickly deploy remarketing pixels in support of the client, which is reasonable. However, I have never encountered a situation where adding an agency or vendor’s GTM container is the best solution (or one I would even remotely consider). Instead, the best approach is to give the agency/vendor access to your GTM container. Now you have full visibility into the change they make and if needed, you can restrict their access so they can’t publish any changes. If you’re implementing multiple containers on the page, you MUST use a single dataLayer. Although you can still rename the dataLayer (e.g. myDataLayer), you must rename the dataLayer for all containers. This is specifically called out in the documentation because in the past, unofficial recommendations were exactly the opposite. 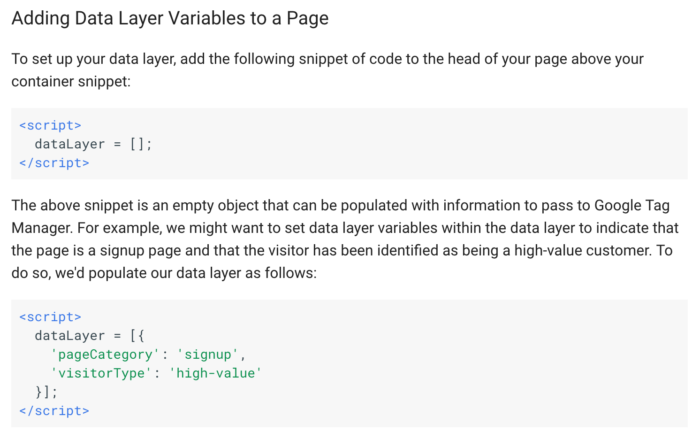 If you follow Google’s advice, the above code will completely overwrite any existing dataLayer variable. If there is already a dataLayer variable on the page with information (key/value pairs) in it, you will lose that information. This method will work if it’s the first time that the dataLayer is instantiated, or if it’s the second time, tenth time, etc. If it finds an existing dataLayer, it will simply continue to add information. If it doesn’t find a dataLayer, then it will create a new, empty dataLayer. Because all containers are using a “shared” dataLayer, any events or other variables that get pushed to the dataLayer are available to both containers. This can sometimes cause issues and confusion if, for example, one container pushes an event to the dataLayer that inadvertently causes a tag to fire in the other container. 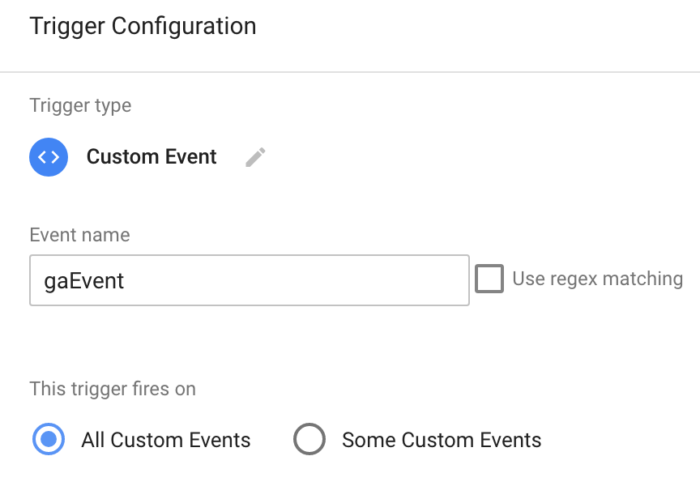 Then they have a single Google Analytics event tag in GTM that triggers on the custom event of gaEvent. This single tag can essentially handle many different events (as long as the category, action, label, etc. is pushed to the dataLayer). This is not ideal for several reasons. As it relates to multiple containers, if both containers were pushing to the dataLayer in the same way, you would be accidentally firing tags for the other container’s dataLayer pushes. LunaMotors is an automotive manufacturer with independant car dealerships throughout the country. As part of their relationship with the dealers, they provide customizable websites. LunaMotors wants to track all these dealer websites (using GTM, of course), but many of the individual dealers also want to track their own websites (also with GTM), so we end up with two containers on the page. However, LunaMotors isn’t aware of this. To make matters worse, they are also pushing a variable called ‘name’ to the dataLayer, with the name of the dealership. So they have a variable in GTM that captures the name variable from the dataLayer, which they think is the name of the dealership, and are sending that as a custom dimension to Google Analytics. Unfortunately, because of the dealership use of the name dataLayer variable, now LunaMotors has PII in Google Analytics. These types of accidental conflicts are less common, but it’s the uncommon issues that catch you by surprise! Remember in the old days of GTM, before auto event triggers, when we had to set up listener tags for clicks and form submissions? If you have any of these relics still hanging around in your container beware – they are not supported with multi-container setups. You will need to migrate them over to the auto event trigger configurations available in V2. Reasons for using multiple containers usually boil down to data governance issues. If at all possible, it’s always best to work out these issues internally and develop a system that only requires a single GTM container. However, if that is not possible, you may find yourself in the multi-container world with the pitfalls outlined above. At least now you know that those pitfalls exists, and how to avoid them.